We have spent 7 years looking for our dream house and location, now that we have found it we want to offer you in Polfages the chance to enjoy the best standards found in English country cottages with the lifestyle that can only be found in the South of France. With in an easy drive of Carcassonne and Toulouse and only 15 minutes from the historic town of Mirepoix. With a location we fell in love with it really is one of the most relaxing and beautiful places we have ever seen. Polfages is an idyllic location for your holiday. Situated overlooking rolling hills with views over to the Montagne Noir on one side and the Pyrenees on the other. It offers a holiday that can be both relaxing and action packed. Polfages is ideal if you just want to sit by the pool and relax taking in the stunning views or if you want to make the most of you time in the region. With the beach just over an hour away and the mountains the same you can truly get the best of both types of holiday. Calmont is 1 of the 3 gites that we offer our guests, each of the gites are individual units allowing our guests their own private space. However one or all of the gites can be rented for larger parties allowing us to take groups of up to 14 people. The gites have been configured to allow large groups to be together during the day but have their own space if they want in the evening. 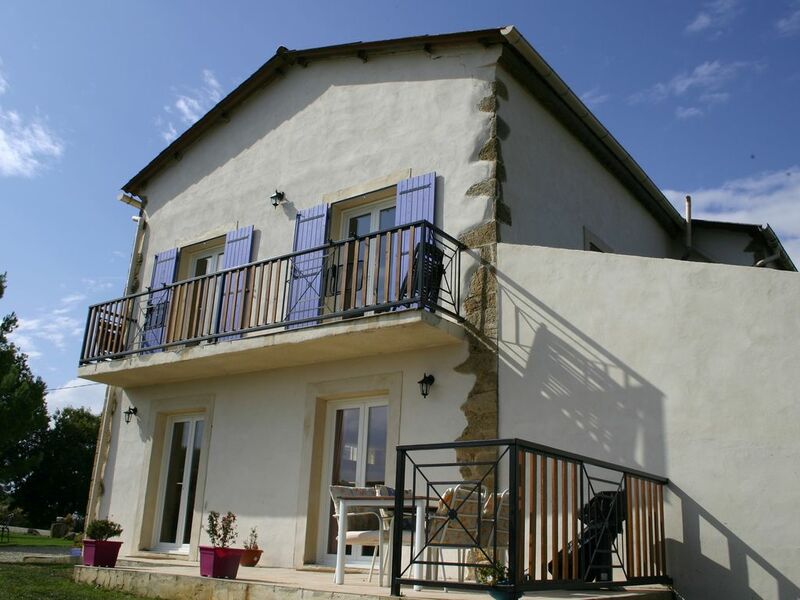 Our gite Calmont is made up of a well equipped kitchen and dining area leading through to a comfortable lounge. The lounge leads onto the private terrace and BBQ area, where you live the alfresco life style whilst relaxing with the stunning views over your own private garden area. You can access the rest of the large gardens and swimming pool from the terrace. Upstairs there are 2 spacious bedrooms each with en-suite. Both bedrooms can be arranged with either 2 single beds or a super king size bed, offering you maximum flexibility and a great nights sleep. Both bed rooms have access to their own private balcony where you can watch the sun come up over the rolling hills whilst enjoying a morning coffee. Perfect- beautiful surroundings, lovely pool, well equipped gite, friendly hosts and gorgeous dogs. We would thoroughly recommend Andrew and Jo's place. Very little can beat the bliss of floating in the pool with a beer and that phenomenal view. Very nice property with stunning views! We have just returned from having the most fabulous week in Polfages. The gite is reflective of the amount of hard work that they have put into it. Idyllic location, stunning views and perfect hosts! We've stayed with Andrew and Jo 3 times and their hospitality and attention to detail has always been beyond compare. They've created beautiful gites and the balcony on this end gite provides perfect views and privacy. We simply can't praise them enough! Pol Fages is in an ideal position with amazing views of the surrounding countryside, the sunrise and sunset is to die for. Jo and Andrew could not have been more helpful and the dogs were an added bonus for us. We love Rufus hehe. The Beclaire Gite was well appointed, especially the kitchen, lounge and bedrooms, although there is a little remedial work required (this is on going). The patio area was perfect for our needs, with an excellent BBQ and gave great views and wonderful sunrises. The pool area also needs some remedial work but again this is planned for the Autumn. If you want peace, tranquillity and beautiful surroundings, I recommend the Gites without doubt. Finally, a holiday is not just what YOU make it, it is what your hosts make it and Jo and Andrew went the extra mile to ensure we had a great time. Thanks to you both!!!!! Warm welcome, lovely gites and stunning views. You will certainly need a car as the gites are quite remote from all shops and facilities. Gites are spacious and generally well equipped, although a freezer or larger fridge would have been handy to reduce the travel for shopping. Some of the fittings in Calmont will need attention soon - stair rails a bit wobbly. Would benefit from some local area guide information to read - although Jo and Andrew easily on hand to ask. Mirepoix is a place worth visiting, especially the markets. Would also benefit from some activities such as table tennis etc. There is space on site for this. We drove to the coast on a couple of occassions which was a good 1. 5 hours away due to traffic - found some lovely beaches and great seafood. Make sure that you like dogs as they are frequent visitors to your gite but very friendly. We flew from Beziers but traffic very busy on way back, so be prepared for this in your planning.